O Canada, we stand on guard for thee — at No. 1! Since “Losering” came out last fall, I’ve had great fun keeping up with it on Amazon.com here and elsewhere. That’s not to say it’s been a best-seller, of course. While the book has sold pretty well, its best U.S. Amazon showing to date is a modest No. 3,162 — enough to keep the American Music Series in business, even if it’s not going to contribute significantly to my retirement. But probably just to keep fools like me paying attention, Amazon also runs “specialty” charts breaking it down into various categories such as music biograpies, rock, country and so on. That 3,162 was good enough to get “Losering” up to No. 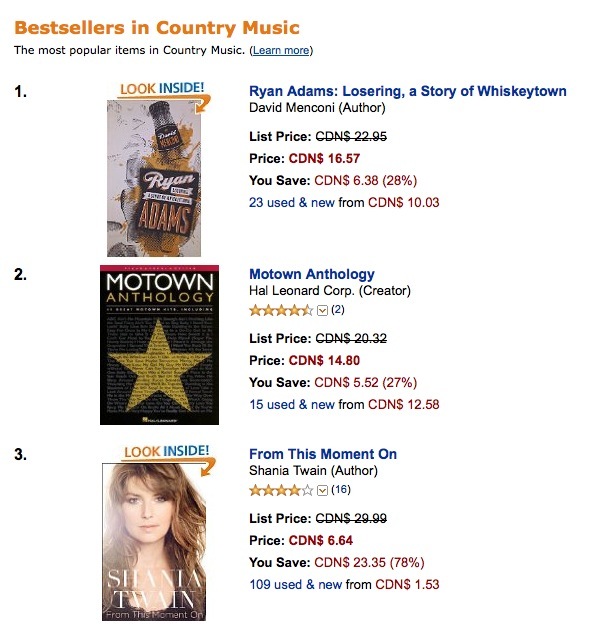 4 in Amazon’s “Country” category, where it briefly lodged as high as No. 2 a few months ago (denied the top spot by Willie Nelson’s “Roll Me Up and Smoke Me When I Die,” dagnabbit). While “Losering”‘s Amazon ranking has since descended a good bit in America, it seems to be doing well on Amazon Canada — where I am happy to report that it hit the top of, if not the poppermost, the “Country” and “Bluegrass” rankings. Yee haw! Friday afternoon, “Losering” climbed to the summit of both. Not sure what “Motown Anthology” is doing on either chart, but what the hell. Now it’s true that my book was only at No. 5,646 overall, so this is nothing to get too excited about. Still, a pretty cool thing to see. Cheap thrills are still thrills in my book.